I'm not referring to the cruisers. I agree that them leaving the field entirely was improper. I'm talking about the freighter captains in that mission. They're military freighters. Same deal. Ok, at start of the 3rd mission it crashes. Log attached. Any ideas? You're using 3.7.4 when Inferno at the bare minimum requires a 3.8.0+ nightly build from May or later. Please get the recommended nighty build. Militarily, do you think Command was right or did the individual captains make the better decision? The mission crashes due to an unknown SEXP, so there's nothing else you could do. Probably you should start a topic on the FSO Support board. The main threat were the bombers, so the freighters made the worst possible decision. If the Lindos would've arrived with the freighters drives not being ready to jump out, it wouldn't have made a difference anyway, all of them would've been destroyed. There were about as many freighters as the Lindos has anti-cap-beams. The only difference I can think of is that the Lindos might have been able to finish 2 of them with 1 beam, but I doubt that it would be important. I've been very excited to play ever since I saw the announcement. Having just finished my first (blind) playthrough, I thought i'd give some initial thoughts and feelings, before I did another playthrough paying a bit more attention. I've always thought that if Blue Planet is the M. Night Shyamalan of FS2 mods, then Inferno is Michael Bay. And true to the Inferno style, Nostos throws around capital ships like confetti and everything explodes. It was certainly worth the wait to see those amazing beam effects and some of the new models - I didn't expect the Vesuvius of all things to make another appearance as an elite fighter that looks incredibly cool. The ship destruction shockwaves are mesmerizing. As a visual experience, I personally can't fault this release at all. I enjoyed it immensely. From that, I'm sure you can gather that I don't play Inferno for the rich, deep storyline that reflects the human condition and keeps me in suspense the entire time. That said, it was great to see more depth to the factions - The EA certainly felt like some kind of military expansionist empire that wanted to conquer the galaxy and there was some nice contrast between the fanatical higher ups and the EA rank-and-file. The Shivans also felt unique and like they had some kind of reason to be there apart from just being faceless bad guys to shoot. Seeing their co-ordinated attack patterns and swarm tactics was very interesting. The soundtrack was great. It was nice to hear some of the old tracks return from R1 and the newer tracks were also pleasant listening. The music changes in response to in-mission events really helped set the mood and the sound effects were awesome - the Vulcan feels so satisfying to shoot. As much as I admitted that Inferno was never really about the story, I feel like there could have been some additional consistency checks. In R1, the story might not have been amazingly deep and kind of all over the place, but it was fairly consistent. If you did good, you did good, and vice versa. I never really got that feeling from Nostos. Sure, there's the whole plotline about Karpinsky being set up, but I feel that for the first half the GTVA just kept taking loss after loss after loss ("There was nothing you could have done to save X") and then all of a sudden it's like the EA is in full retreat in mission 7. I'm also not sold on command's logic behind only deploying a Destroyer and a zod cruiser to hold the Delta Serpentis node. I'm guessing it was for mission balance, but there's probably a better way to explain it away. The mission balance was interesting. Playing on medium - I'm a scrub, don't judge me - there was only one time when I truly felt overwhelmed or paniced (and i'll get to that later). At the same time there was only a few times when I felt like my actions made a significant difference to the mission outcome, like de-beaming the Tereus in mission 10 or whenever the missions let me pick Corinthos to spam. I'm not sure whether this is a good thing or a bad thing, so I guess it's just something to note. Speaking of the Corinthos - I never found any reason to take anything else once you get it, it's head and shoulders above every other weapon. Mission 12 felt completely broken just having a bunch of them and spamming shift-r. I don't really think this is necessarily a problem with the Corinthos itself but rather the weapon balance in general. While I haven't looked at the tables yet, pretty much everything except the Corinthos felt horribly underwhelming, which is not something I expected from Inferno. In R1 I never really felt shoehorned into a single loadout or option except in the scramble missions (and maybe nemesis) but in Nostos most of the weapons feel like i'm shooting blanks. Likewise, the ships felt fairly boring to me. Perhaps this is just me, but Inferno has always reminded me of a cheesy 80's action movie where you're Stallone/Schwarzenegger and you chew through hordes of bad guys while bullets bounce off you. Nostos never really gave me that impression - bullets certainly bounced off the waves of EA ships that I had to shoot at, but none of the ships really gave me a "wow" moment. The Perseus adv felt more like a flying balloon full of spontaneous combustion and with how frail it was (and how quickly the primary energy drained) I never felt rewarded doing anything but sitting at range spamming Corinthos. Granted, I haven't tried the Hastor yet, but the "level 1 shield damage" and 800m range don't encourage me to take it as the Perseus' only primary weapon and i've not peeked in the tables to check the actual stats. The little script that highlights certain targets and subsystems was an awesome addition, but it brackets the "unknown" alt named shivan ships with the class name from the table, so it keeps switching from "SC Unknown" to "SC (class name)". The biggest problem that I have with this release is that it feels very unpolished. I didn't keep track of all the little problems as I went, but there were so many little things that would have made the experience a lot better if they were fixed - being able to give orders to ships you're not supposed to order (shoutouts to the one nav buoy you can order), capships coming out of warp at 300 m/s and doing a 90 degree turn in seconds, capships having funny paths and looking ridiculous while turning, dialogue that seemed to be poorly timed or didn't make much sense, stuff like that. I wouldn't feel comfortable recommending Nostos to someone newer as a direct result of this because of all the immersion breaks and little questions that i'd get. Following on from that, there's no Species.tbl - as a tech room enthusiast I was a little bummed out to not even see the INFR1 table thrown in there as a placeholder. The dialogue box is pretty cool but it tends to disappear before the text fully finishes displaying. It's a little frustrating getting halfway through a sentence and then the text you were reading just vanishes and relocates. I'm not sure how or if this could be fixed, or whether it's a huge priority however. I mentioned that for the most part, the mission balance was ok - However, missions 13 and 14 were really, really annoying. I died the first time in mission 13 because I was admiring how all the ships warped in pretty triangle formations, and then I had to sit through all the boring "go here, scan that" again. Granted, that was my own dumb fault, so i'll cop that on the chin. When I did it the second time I survived with only 9% hull and the only wingmen that made it through were Beta 1 and Beta 2, also on critical hp. This made for a very frustrating mission 14 - not only was command sending himself messages (As the rest of Alpha wing was dead), but I had to take on what felt like an entire shivan fleet with just 2 half dead wingmen before the SOC jocks arrived and I was able to get a support ship (Corinthos spam coming in clutch). Not that i'd recommend them for Special Operations - they didn't seem to do much. The only alternative to "git gud" would have been to replay the previous mission, and I really didn't want to sit through it again. Perhaps this is just me, but even if there was just some recommendation at the start of the mission says "Hey you're gonna have to fight lots of dudes, maybe you should consider doing the previous mission again", it'd reduce the (potential) frustration from this mission immensely. I also took off most of the Sammael's turrets in mission 14 and seeing it come back 100% ready to go in mission 15 was kind of funny, but I don't remember a time specified between missions so it was probably just repaired. Overall I had a great experience with Nostos and i'm looking forward to playing through it again and pouring over the missions and tables. 15 years of waiting was certainly worth it in the end and i'm really excited for the second part. Mind you, at the current rate of releases i'll probably be dead before we ever get past the EA war, but death is a small price to pay for such shiny beams. 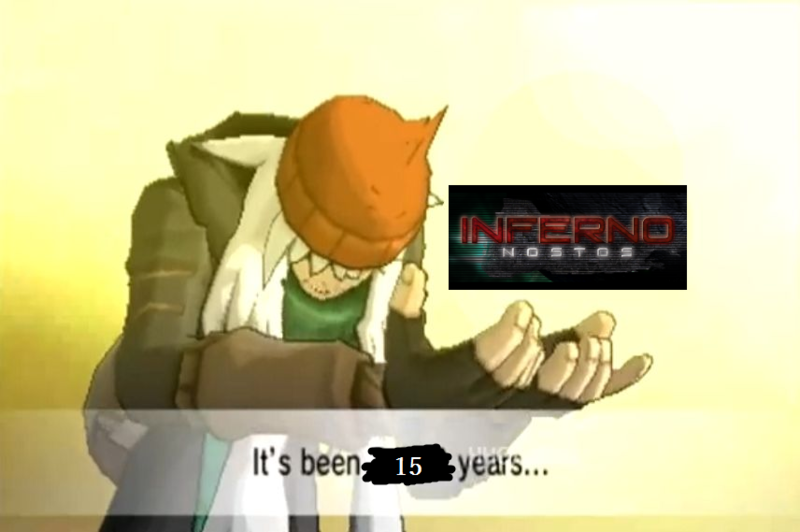 New Inferno released? Mein gott. Regarding the Corinthos: The missions in R1 where you do have access to it are essentially tuned to show off the Corinthos. The EA warship in M11 for example has its beams nerfed to be destroyable by 2 Corinthos, where usually it would take 3 Corinthos shots or 2 Stil3 shots. Also, the Shivan ships you fight in M14 are all FS2-era, and the Corinthos is the result of 20-ish years of iterating on the Treb so I think it makes sense to have it superior to the Treb at long-range anti-strikecraft, even though it's actually severely nerfed compared to the original Treb in terms of anti-subsystem work. Any way to possibly alleviate my FPS issues? In my experience new FSO builds perform like ****. I don't know if it's actually the builds or scripts or what. Also is AI able to use them? I just noticed that in my nearly 20 years of playing FS2 I never noticed beign shot upon by trebuchet. By default, AI can't use trebuchets because of how missile logic works. The trebuchet has the "bomber +" flag, which makes the AI prefer to use it against bombers and never uses it against capital ships. It also has the "Huge"(yes, Huge is a weapon flag while "Big Damage" is a ship flag, don't think about it too hard) flag which makes it able to kill destroyers and also makes the AI only ever use it against capital ships. So the AI can't ever fire the trebuchet. However with FuryAI this problem can be fixed using the "Smart secondary weapon selection" flag, this is what BP uses to get its AI to fire trebs(and you'll have to dodge quite a few of those in WiH). You can change the retail AI_profiles table to let AI use trebs in FS2, however this totally breaks the game. Maras and Basilisks carry trebuchets by default and their loadouts are very rarely edited so you'll be dealing with massive trebuchet storms as soon as the Shivans show up. So there are two contradicting flags that confuse AI, correct? Is this also a case for Inferno Corinthos?